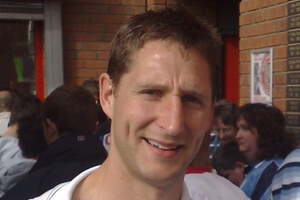 Robbie Elliott had two spells at Newcastle, the first one under Kevin Keegan from 1991 through 1997, and then he was brought back on a free transfer from Bolton in the summer of 2001, when Bobby Robson was the manager, so Robbie was fortunate enough to have played under two of the most successful Newcastle managers in recent times. And the 39 year-old has given a long interview in the Chronicle today, and he’s as shocked as the rest of us, about how the transfer business was conducted this summer. Newcastle – make that Joe Kinnear – didn’t seem to have much of a clue at all, as to how to get our top targets through the door, and we ended up with only Loic Remy on loan for the season. If we had signed three or four good players this summer we could have taken the side from fairly good to very good, and even had a chance of making the top six again – but no – it wasn’t to be, and money, or more accurately – the unwillingness of the owner to spend it – got in the way again. Robbie was born in Gosforth, and in July of 2008, he returned to Newcastle for a third spell at the club as the new assistant Fitness and Conditioning coach, when Kevin Keegan was manager, but he finally left the following summer when we were relegated after a tumultuous season, and Newcastle were in complete and utter turmoil. Since he left Newcastle, Robbie Elliott has done very well working in America with the US Soccer Federation, as the Youth National Team Performance Expert. It’s good to hear from Robbie again. Previous Post Could New FA Rules Affect Newcastle's Transfer Policy? Ed still likes to typo Newcastle I see. Its like a trusty old pair of slippers. Back in your box Skunki. I think this was actually from his twitter account. 8. Is annoying the supporters something you enjoy? WW, you going to Harper’s testimonial? Ashley robbed me of a quid too but had cup o’ tea and 2 bacon sarnies at his expense other day so don’t feel so bad about it now. Just sent you an e mail intended for a mate of mine in Aberdeen, just ignore it. A mate of mine is saying he hopes the testimonial is spoiled by anti Ashley protests, but I’m sure Harps wouldn’t mind at all. Tsunki has reared his ugly head again I see. Patsies like him will never let the club come up. Testimonial already being spoiled imho by inclusion of Paolo Di Canio but if Harps is happy so am I.
WW, thought you were in Germany? I had invite from club to gates ceremony so I got my moneys worth when I had the chance ha ha. Will ignore mail Jail, no bother. Himanshu Anagram – Are you calling me a Pastie? Thats not nice at all. I think I am more of a large meat pie. And although you know nothing about my head, I know exactly what type yours is. Sayonara Dingrat, I am off again until the blog has peristaltically disgorged you and some kind of news is on the go. I know it could be a long wait. So the blog is now a better place with the demented and schizophrenic going. We are in for a torturous week until the Villa game kicks off and the attacks on Pardews tactical nous and his inability to get the team that kindly benefactor Mashley has put together begin. maybe thats why we could not get anyone over the line too many Syrians getting in the way. Ashley should come out and talk, tell us all what the plan is. After all it’s the Newcastle fans that line his pocket. The challenge is set. If someone from the club reads this, it’s that what people hope for. You cannot work it out. It is called asset stripping. But he cannot come out and say that so he keeps stumm. Its not asset stripping, its pocketing the profits. Theres a difference. MA will eventually ruen our club. He knows exactly how to upset the fans and gets a kick out of doing it. As long as we’re in the premier league that’s all that matters, he even gambles with that too save money. The protest may wake Ashley up to the fact that unhappiness with the way the team is being run is growing again. An owner has obligations as well as privileges. Most owners don’t need to be reminded of that but ours has always been a little different. Its been far worse at NUFC, in Remy and Cisse we have two proven strikers unlike when we had Lovenkrands Ameobi and Best. The midfield is strong enough to tackle most outside the top four. With Pardew as Manager, Newcastle is the envy of every non-league Team. Robbie Elliot sums up the mood of this blog on deadline day pretty damn well. Yeah, I knew those nicknames would kill the blog. Shame some of our former players don’t get together with the money they earned as players,that they’ve hopefully invested wisely and buy Ashley out and get this club back on its feet. Must say I was really for a fans takeover with the supporters group and wanted to invest a Grand of hard earned cash but it never came about. Hopefully one day we can own the club! Roy @ 28 – Oh that’s alright then. I feel so much better for that statement. Will sleep well tonight. I bet you think that Kinnear is better than the DOF we had before? Oh we never had one? Well there’s a thing. Is anyone else getting a bit worried about JFK? I mean, no one has seen or heard a peep from the old boy for a week or so, and he was last heard of wandering to no purpose round the South of France. Given that he might alarm the French authorities with his bizarre public announcements and his implausible claims, is it possible that the French have him sectioned in some secure accomodation? They are not going to believe him when he claims to be Director of Football, and he probably gets a double librium every time he asks for a phone to call Arsene Wenger. I suppose they might simply have deported him as an undesirable vagrant, but does anyone think I should contact the Embassy in Paris just in case the gendarmes have handed him in? J F K is working at Billy Smarts Circus until next transfer window opens. Roy@28-at least theres someone with optimism on here.